Municipal Court is held Wednesdays at 1:00 p.m.
A dedication of the Public Safety Complex at 248 Hamilton Avenue was conducted by the Borough of Hasbrouck Heights Mayor and Council on December 20, 2003 at 2 p.m. The Public Safety Building will house the Hasbrouck Heights Police Department, Fire Department and Municipal Court. Superior Court Judge Sybil R. Moses at the Bergen County Justice Center on January 3, 2000. Judge Chandless is the longest sitting Municipal Judge in the State of New Jersey. Municipal Court is in session every Wednesday at 1 PM at the Masonic Hall building, 200 Division Avenue and Judge Harry H. Chandless, Jr. presides. Judge Chandless has been Municipal Judge in Hasbrouck Heights for 34 years. Court is sometimes held on other days if the court calendar is too large or for special cases such as DWI cases with expert witnesses when the trial may be prolonged. Any one is permitted to attend and observe Municipal Court sessions. During an average week, Judge Chandless issues two Temporary Domestic Violence Restraining Orders after taking sworn testimony from the complainants. The Judge may also perform marriage ceremonies. The Judge is also frequently called by the Police Department to issue Warrants and to set bail. Judge Chandless also sits in other Municipal Courts if an emergency develops regarding another Judge and may also be contacted by another municipality's Police regarding Warrants or Bail in the absence of their Judge. The same arrangement pertains to the Hasbrouck Heights Municipal Court. During court sessions, Mark Musella and/or Thomas Mason act as Prosecutor; Fred Allen is Public Defender. Susan Paul is Court Administrator, with Estelle Hackel as Deputy Court Administrator. A defendant may contest any case by appearing on the Court day after notifying the Court Administrator 7 days before the hearing date so that witnesses can be notified. Or the defendant may submit an Affidavit on certain cases, including parking cases, upon giving up the right to appear. Check with the Court Administrator, 288-4004, as to type of case permitted to plead by Affidavit. Recently, the Court refused a motion to amend a speeding charge to a lesser charge against a Lodi man and the defendant was granted a postponement to obtain an attorney. Judge Chandless said that the this Court's policy was against amending speeding charges to a"no point" charge, until there is a change of driving habits in town, ..."if they have to sit in Court all night to hear contested cases." The Judge stated that the August 16th session marked the 34th year he has been Judge of the Hasbrouck Heights Municipal Court. He said that the Court had always operated smoothly and efficiently because of the fine Administrative personnel over the years and the support given by the various Mayors and Councils, the police department and Borough employees. " In all my years here as Judge, I can think of no incident that ever occurred entering, inside or leaving the courtroom which caused any threat to or fear in anyone. People are usually on their best behaviour when they come to court. " The Supreme Court mandates that all courtrooms be open to the public during court sessions, the Judge indicated, and recalls that Hasbrouck Heights Municipal Court sessions were visited by grammar school classes brought by their teachers to observe at various times over the years. He also recalled seeing many who had offices or meetings in the old Municipal Building and who would stop in during some court sessions. He said that he remembers Andy Feintuch frequently observing court sessions, even when Mr. Feintuch was in a wheelchair. He thanked all who have helped to make our Municipal Court one to be proud of. A law went into effect September 5, 2000, granting the defendant, charged with both refusing to take a breathalyser test and driving under the influence (DWI), the right to plea bargain by pleading guilty to DWI and having the refusal charge dismissed. Previously, the six months revocation for refusal could not be dismissed and was added to the six months revocation for DWI upon conviction of both charges. It also appears that DWI and drug charges may now be plea-bargained, with the Municipal Judge's approval, which Supreme Court Rules previously prohibited. In July, 200, the NJ Legislature overturned the NJ Supreme Court Ruling prohibiting amending moving motor vehicle charges to a charge which would have resulted in no points against the defendant's record with the Department of Motor Vehicles. The new law permits amending a point-producing charge, such as speeding or passing on the right, to a new charge without points, created by the Legislature: "Unsafe Driving". (This is different from "Careless Driving" which requires point assessment upon conviction). The difference between those two offenses is difficult to see, except by the result according to Judge Chandless. As Judge of the Municipal Court of the Borough of Hasbrouck Heights, it is difficult to add much more than was summed up in The Record editorial, which said Hasbrouck Heights and its people are to be commended for their spirit, resiliency, and heart, about the disasters that recently struck. I thank all those of the Municipal Government, officials and employees, who have assisted in keeping the Municipal Court functioning without scarcely missing a beat. I should point out that Mayor Torre, the Borough Council, and Finance Official Michael Kronyak have lent much support as well as the DPW head Bob Heck and workers and others in planning and moving equipment. This was needed to establish the present Municipal headquarters at 218 Boulevard where our brand new Municipal Court terminals which record and store our records are now located and where Violations Bureau fines are being routinely collected. This cooperation was also needed to set up our Court for hearings at Gehrig Hall, Euclid Masonic Lodge, 200 Divisions Avenue. It is not possible to name all those who have directly contributed. It is, I believe, absolutely fitting to thank the local Masonic Lodge #136, whose building houses Gehrig Hall, for the generous and immediate response to provide the needed and appropriate place for Court proceedings without cost to the town or taxpayer. It is in line with their stated purpose, To make good persons better.. Their members, Otto Gehrig, who lived in Hasbrouck Heights for 40 years before retiring; Gill Hunt, the Secretary; and Robert Searle, the liaison from the fraternity to the town, who both still reside in town, as well as others, have given freely of their time. Time, in this day in age, is one of our most valuable commodities. I also want to commend my Acting Court Administrator, Susan Paul, and Deputy Court Administrator Estelle Hackel for coping with this enormous rearrangement and additional duties. In addition, I want to commend the former Court Administrator, Teresa Vertino, who, past her retirement date of January 1, has been helping the Acting Administrator. Thus far, the Administrator has not received the promised help from Trenton; As Mayor Torres slogan on the ribbons distributed at the January 1st reorganization meeting said, Together--We Will. We will keep this town great. Hon. Harry H. Chandless, Jr.
Judge Harry H. Chandless Jr.
Harry H. Chandless Jr., is a well respected member of the legal community with over 35 years of experience in the general practice of law. Mr. Chandless is a graduate of the Columbia College and Columbia Law School. 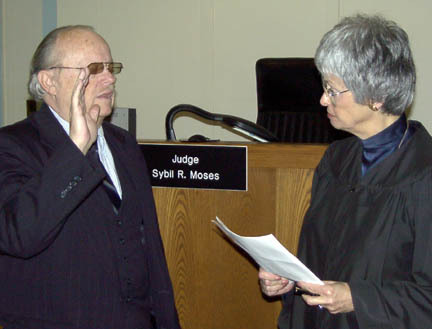 He has served on the bench as a Municipal Judge for over 32 years. He is a member of the Legal Fraternity of Phi Delta Phi, as well as numerous local, civic organizations. He now specializes in Wills, Living Wills, Estates, and Power of Attorney. He is a licensed NJ Attorney and Counsellor At Law; a life member of the Bergen County Bar Association; past President of the Lions Club and a member of the Elks, Euclid Lodge 136 F.& A.M., and the Municipal Judges Association. NJ LawNet- http://www.njlawnet.com/ A great resource for anything dealing with NJ law and statutes. NY LawNet- http://www.nynylawnet.com/ A wonderful resource for subjects dealing with NY law and statutes. The Law Engine- http://www.fastsearch.com/law/ An excellent search engine for finding legal/law based information.